A Strong Man's Cup of Tea: Is That a Chicken Leg on Your Wrist or Are You Just Happy To Be Here? Is That a Chicken Leg on Your Wrist or Are You Just Happy To Be Here? Or if you attended Leslie County High School in 1989, I'll Be There for You. It's prom season, that special time of year when girls spend an inordinate amount of money on a dress, shoes, and accessories and guys shell out $89 for a rental suit. 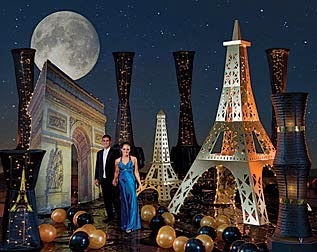 Prom is a rite of passage for teenagers, giving many their first real taste of adulthood. They are allowed to drive a car for the evening that is usually 3-4 level grades above what they normally drive to school. 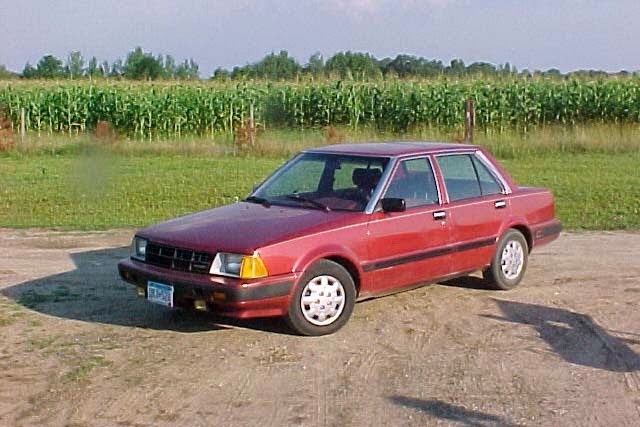 In my case, I was allowed to drive my Mom's car, which meant it had two working windshield wipers, did not smell like sweat and hush-puppies, and would accelerate faster than 52 miles per hour--all details that could not be said for my regular wheels, a Datsun Stanza (RIP, Stan). Prom also means dinner reservations, and eating at a restaurant that doesn't make you order your food at the front, wait there for it, and then carry it on a tray back to the seating area. For most teens, this is huge. 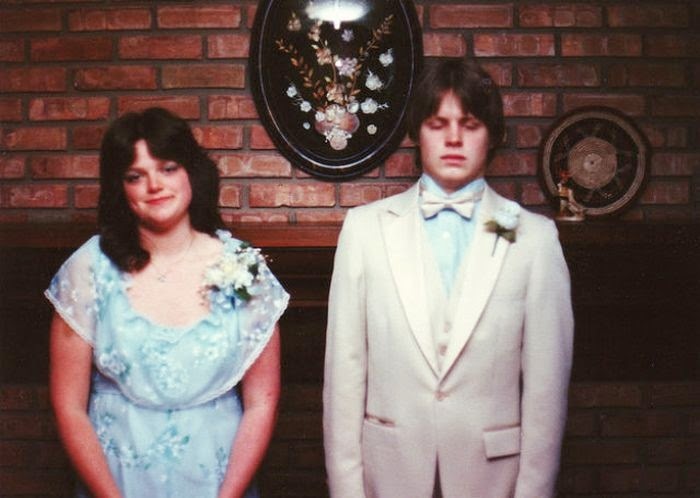 When I was in high school, showing someone a big time on a Saturday night usually meant a stop off at the Taco Bell and then a stroll through the local Wal-mart. If I had some extra coinage, I may have sprung for a DQ Blizzard (that would we split, I wasn't made of gold) for a nightcap. So, to actually go to a sit-down-look-at-a-menu-and-keep-your-voice-to-a-minimum-level type of restaurant is a big deal. must be the shade of his date's dress, the car must be washed and waxed, her hair must be hair-sprayed stiff enough to withstand hurricane-strength winds. It's all about the details, people. One detail that perhaps has not gotten enough attention in the past is the traditional corsage given to the girl by her date. Corsages are usually an unfortunate afterthought--a simple flower in the right color family of the young lady's dress picked up on the way to start the evening. 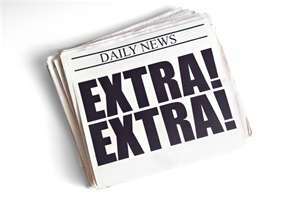 Well, get ready to clutch your pearls because I have some big news! 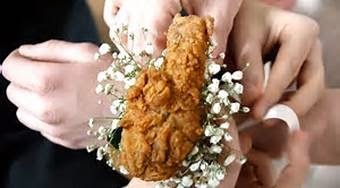 Thanks to the good people at Kentucky Fried Chicken and Nanz & Kraft Florist, you can be the toast of the town at this year's prom with the KFC Chicken Corsage. If you are local to the Louisville area, fresh baby's breath will accompany your chicken leg fixed in your choice of Original Recipe, Extra Crispy, or Kentucky Grilled. If you are an out-of-town customer, don't fret, you can still order. The only difference is your baby's breath will be artificial. But anyone who has seen artificial baby's breath can tell you it is just as classy. Just so we are clear, THIS IS A REAL THING. Click on the link here to order yours, but you had better hurry because they are very limited and once they are gone, well, they are gone. I Am Ordering One Right Now! If any of you do order, will you please snap a photo and send to me? And while we are talking about it, there is nothing saying you have to be going to the prom to send one of these to someone. In fact, it would probably make a very good gift to your favorite blogger. Just a thought. I love chicken. And flowers. And baby's breath. 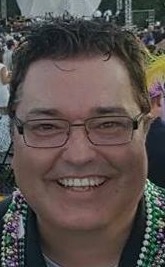 Real or fake. Why does it make me happy that this exists? Probably because I do always like to have a snack on hand. I don't know that we should limit ourselves to prom corsages. I can think of multiple times I could have benefited from a chicken leg strapped to my wrist. I was always hungry at prom. "I'll be there for you" seems to be the best prom theme in the history of ever. If you also had a Bon Jovi cover band, I will pass out from jealousy. Other Easter Traditions or Happy Smingus-Dyngus!